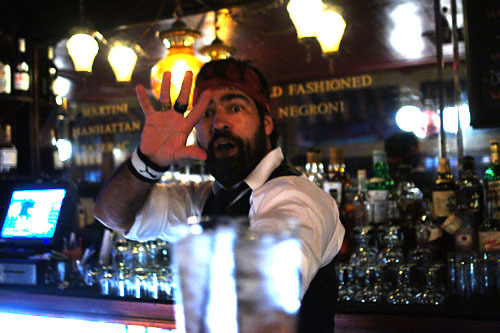 Who's LA's best bartender? That's the question Table20, an in-development web site dedicated to facilitating the hiring process in the restaurant/bar industry, set out to answer. Dozens of bartenders from all around the City were nominated by cocktail-minded individuals, and from that field, the group was whittled down to a final six: Matt Biancaniello, Joseph Brooke, Max Diaz, Devon Espinosa, Dee Ann Quinones, and Alex Straus. It was then up to us, the judges--Caroline, Chris, Liz, Victoria, and myself--to visit each bartender and come to a consensus on who should take the title of top tapster. The results of my visits are shown below. Note that, due to schedule conflicts, I was not able to visit Dee Ann, and thus my ranking of her will not be counted in the final result. Each judge was given the freedom to choose his or her own method of grading. 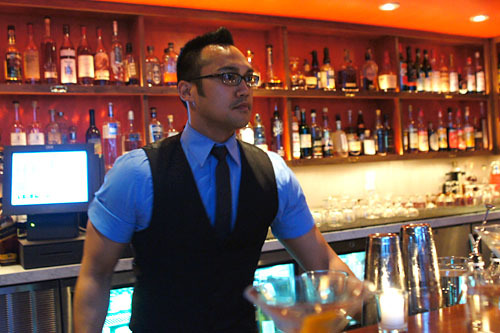 For me, I requested that each bartender prepare three cocktails: one savory, one bitter, and one "dealer's choice." 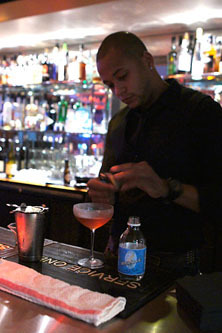 In addition, some of the contestants chose to make additional cocktails; however, these were not included in the final ranking. The contestants are listed below in alphabetical order, which coincidentally was the exact ordered that I visited them. Breeders' Cup (Gordon's gin, agave, beet, horseradish, cucumber, lime, kosher salt) - Our first cocktail from Matt showed off strong hints of cucumber on the nose, which was joined by heady flavors of horseradish on the initial attack. 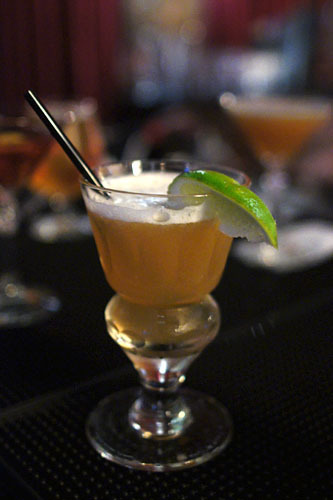 The agave added a palpable weight to the concoction, and the drink was almost Bloody Mary-like in character, with a lovely, subtle bit of saltiness on the finish. Great color, too. Three Faces of Van Gogh (Cynar, crème de cassis, passion fruit) - Complex, sugary, fruity bouquet on this one, which continued in great fashion on to the palate. The drink's flavor, however, quickly changed from saccharine sweet to the bitter vegetal relish of artichoke, a transition that I quite enjoyed. 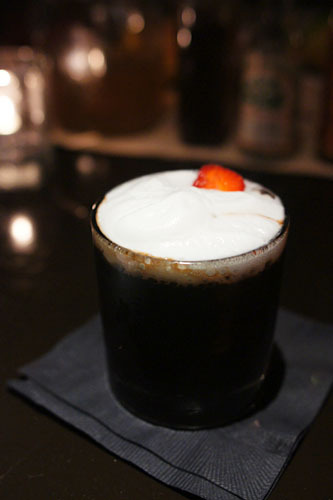 Last Tango in Modena (Hendricks gin, muddled organic strawberries, aged balsamic vinegar, St-Germain foam) - This was probably my favorite of the troika. It was almost dessert-like in nature, being slightly reminiscent of strawberry ice cream. 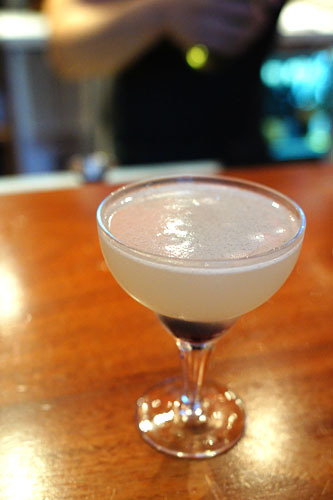 The amalgam of berry, St-Germain foam (egg white, lime), and balsamic formed a sweet, yet harmonious commixture that melded flawlessly with the gin. 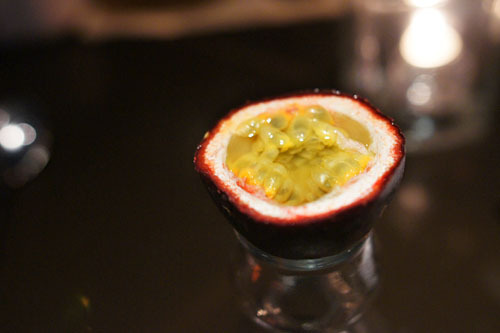 Prior to the three cocktails above, Matt began with an "amuse bouche" of sorts: a hemisphere of passion fruit, bathed in agave nectar and Hangar One vodka. 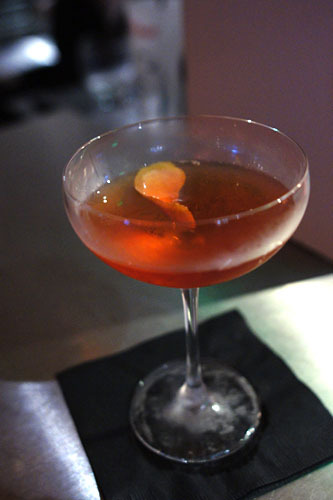 It had a keenly fruity relish to it, which was subsequently augmented by the smoky agave, while the vodka actually provided some levity with its hot finish. Following the trio, he served up a palate cleanser, a black mission fig-infused Bourbon with delightfully dark, heavy, sweet and savory flavors--really helped take the edge off. We closed with a dessert cocktail. Entitled Un Cafe Va Bene, it was composed of Cynar, cassis, and espresso, with a superb coffee bitterness kissed by the sweetness of cassis. 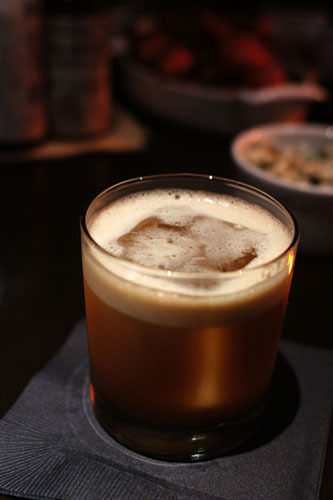 Smoky Mole (mezcal, crème de cacao, Chartreuse, sweet vermouth) - This drink did a great job in showing off the brazen smokiness of mezcal. 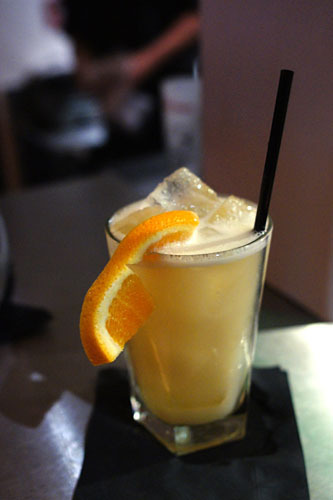 However, it was also nicely moderated by a citrus component, while the rest of the ingredients contributed alternating hints of saccharine and pungent flavors to the cocktail. Apple One (Bourbon, Angostura bitters, egg white, apple juice, elderflower, lemon) - Our next cocktail had an almost numbing, "tannic" character that I quite enjoyed! 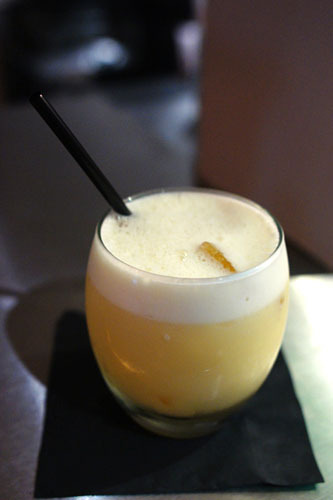 The egg white formed a lovely base to the libation, and I appreciated how the sweet-tangy notes of apple and elderflower tempered the power of the whiskey. Invierno (Rhum Agricole, apricot liqueur, apple juice, lime, cinnamon) - This was a wonderful winter-y cocktail with a present, but not cloying sweetness. The spicy, lime-tinged nose was superb, and I loved the interaction between the apple juice and rhum. Quite refreshing to boot. 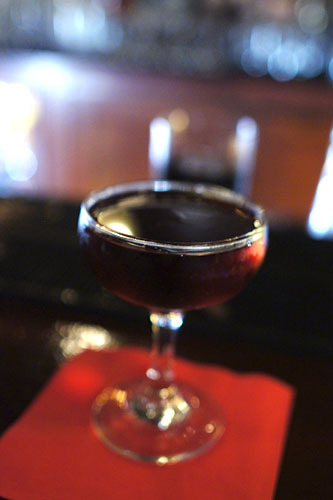 Black Manhattan (101 proof rye whiskey, Amaro Averna, Angostura bitters) - We began with Alex's take on a classic cocktail. 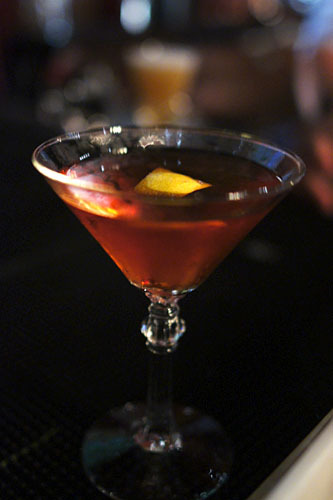 It was a great twist on your traditional Manhattan, with darker, sweeter flavors tinged by a bitter herbaceousness. 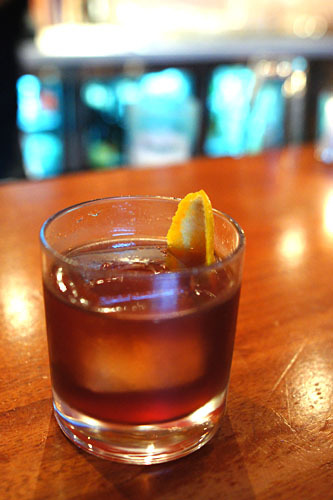 A very good use of Amaro Averna here. 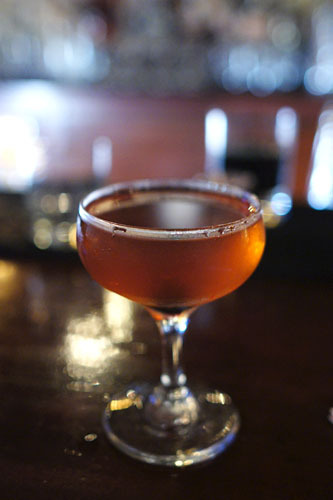 Hanky Panky (Beefeater gin, Carpano Antica, Fernet-Branca) - Our next cocktail showed off a lovely citrus nose, leading to an apparent body of gin. 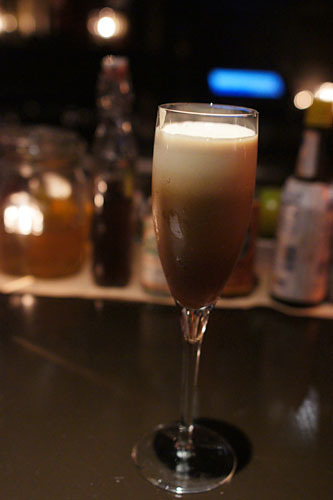 The base liquor, however, was deftly complemented by the subtle sweet-spice of the vermouth, and I really applauded the bitter-herby application of the Fernet. 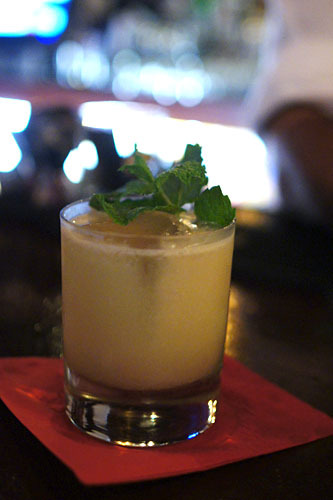 Elton McGregor (blended Scotch, absinthe, orgeat, mint, [Laphroaig]) - This was almost like a two part drink. It originally was served sans Laphroaig, and had a great bouquet reminiscent of licorice, while the sugariness of the orgeat went beautifully with the liquor. 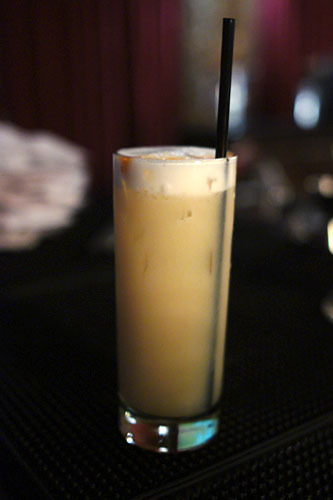 What took this drink to another level, though, was the addition of the Islay single-malt. It added a stupendous smokiness to the cocktail that went perfectly with the mint, resulting in a "green," almost grassy flavor. 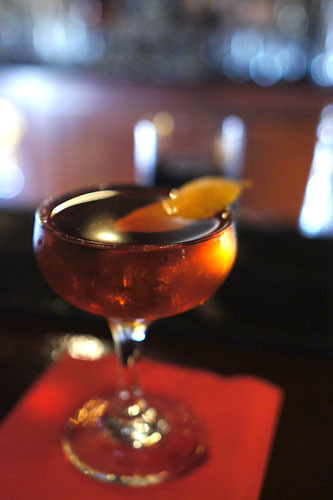 Alex's fourth cocktail was deemed the Bobby Burns, and was comprised of blended Scotch, Bénédictine, Carpano Antica, Chianti, Licor 43, and Maraschino Luxardo. I quite liked the interaction between the Scotch and the herby sweetness of the Bénédictine and Licor 43. Great aromatics! 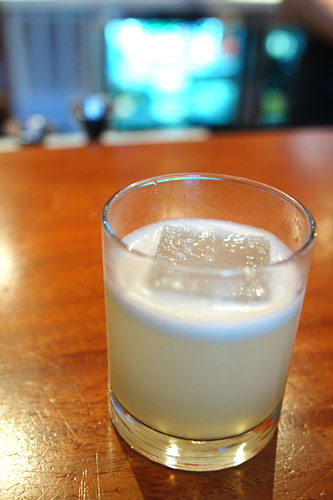 Falernum (Ron Matusalem, falernum, lime) - Very nice, with an herby, almost medicinal nose. The taste was more of the same, with fantastic overtones of lime and a marked bit of fruity sweetness to counteract the power of the rhum. Loved the viscosity on this one! 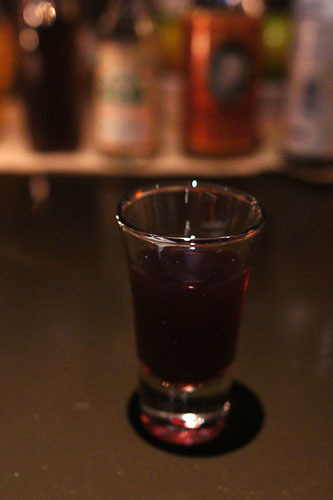 Cure-All (Buffalo Trace bourbon, mirto myrtle berry liqueur, kola tonic, Luxardo Fernet amaro) - The bitter-tart flavors were very apparent on the palate, and yet expertly complemented by the heft of the whiskey. Meanwhile, a hint of overarching citrus helped balance the drink, and I really appreciated the slight bit of sweet heat on the finish. Morning Bracer (Oxley gin, "Luli" wine, Maraschino Luxardo, lemon) - Superb aromatics on this cocktail, showing off a great complexity and depth. The taste was similarly cerebral, conveying a great interplay between the lemon and Luli, with a delightful gin tinge on the finish. For extra credit, Devon made a Task Collector, with gin, dry vermouth, green Chartreuse, and orange peel. This was an unabashedly herbaceous concoction, with a light citrus nose leading to an almost celery-like taste on the palate! Note that the photos below are clearly not of Alex Straus, but rather of his compatriot Steven Shumate. Alex was terribly ill on this night, and thus was on the phone with Steven, instructing him realtime on which cocktails to prepare for me. Steven did a great job in executing Alex's vision. "Untitled" Savory (Chivas Regal, egg yolk, simple syrup, lemon, chocolate bitters) - The savory had a fantastic aroma that instantly piqued by interest. It was awash in frothy, eggy goodness, with a great touch of fruity sweetness as well, all over a subtle undertone of Chivas. The finish was amazing, with a wonderful bit of lingering savoriness. Great mouthfeel, too. "Untitled" Bitter (gin, Amaro Nonino, whiskey bitters, Peychaud's bitters, flavored lemon peel) - This one showed off an intoxicating nose redolent of caramel and citrus. On the palate, the drink was peppery and herbaceous initially, but sweet on the transition, with a great depth of flavor. Very cool. 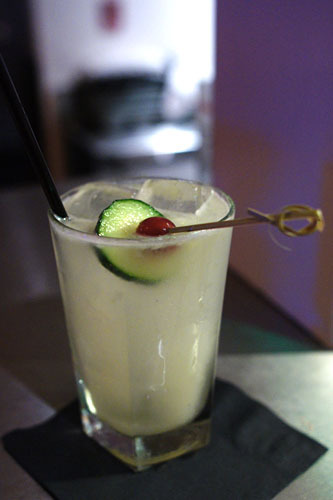 Tequila Spa (Calle 23 tequila, simple syrup, muddled red grapes, cucumber, orange, lemon) - Marked cucumber-y bouquet on this one, intermingled with the woodiness of tequila. This was a great, refreshing summer libation, a nice alternative to a margarita. I liked the overarching citrus notes here, and how the sourness just creeps up on you. Alex and Steven also served up a rum punch, composed of Smith & Cross rum, DonQ blanco and anejo rums, cachaça, orgeat, simple syrup, lime, pineapple, and orange. As expected, this was a fun, festive, fruity drink, with the orgeat balancing the rums beautifully. Well, we don't know that quite yet unfortunately. The winner will be announced at an exclusive wrap party to be held at Takami restaurant and lounge, located 21 floors high above Downtown LA (the view is quite breathtaking). The event will take place on October 4 from 7:00-10:00. 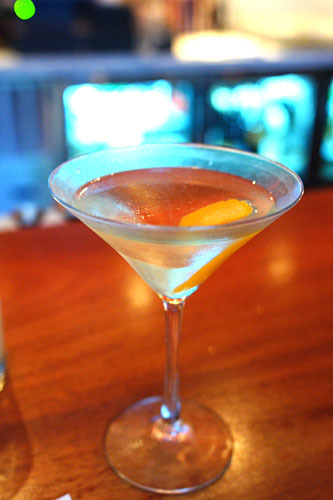 Yes, it's a Monday, but that's one of the few days that all our bartenders have off! 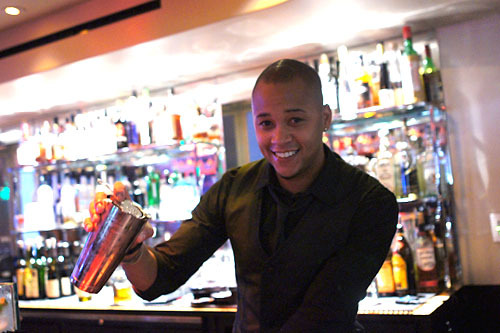 In addition to being able to mix and mingle with our top barkeeps, judges, and fellow cocktail connoisseurs, and perhaps trying out some of the creations described above, each contestant will be creating a signature rum punch cocktail for guests to enjoy. Yes, we're talking free booze. No tickets will be sold to the celebration (and the event is limited to around 100 guests), so how does one go? Simple, I'm giving away five pairs of tickets! 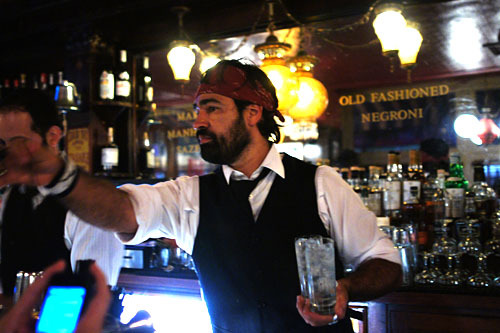 All you have to do is leave a comment telling us your pick for LA's best bartender (it doesn't have to be one of the finalists) and why. Be sure to include your name and email, and please post by 11:00p on Saturday, October 2. Good luck! 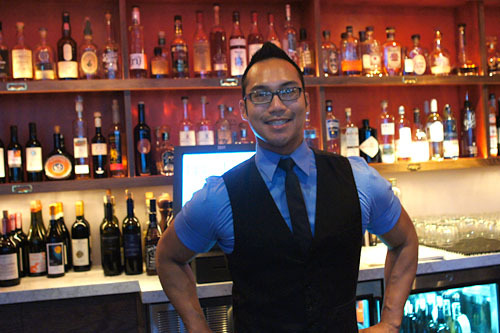 Devon at the Tasting Kitchen is awesome with his personality and he makes great drinks! 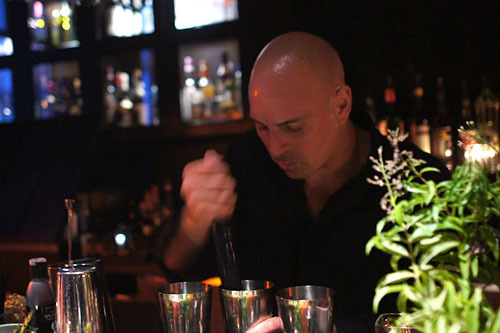 Seven Grand is a great spot...especially when you have George making great drinks that are consistant and delicious. Having had the pleasure of drinking his imbibements on more than one occasion, I'll have to go with Devon -- and yes, I want those tickets! Wow! This is a tough field of finalists. They're all awesome. But if I had to pick one, from reading your post, it would be Matt Biancaniello. I loved how the cocktails were like a tasting degustation. I am a beer kinda guy, but would like to attend Table20 and learn more about cocktails (primarily to help introduce my fiancee to social drinking). From the bartenders you've listed I would have to go with Max Diaz. Based on description alone, his drinks seem simple, fun and strong. I'm going with Eric Alperin, and not just because he's such a hottie. 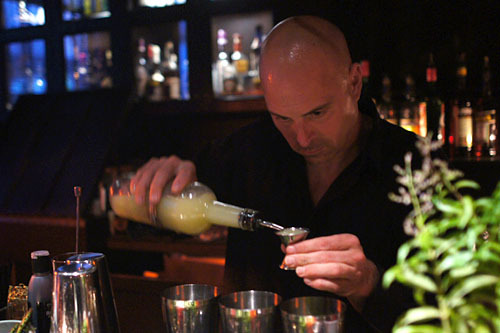 The guy makes the best drinks I've ever consumed, less your fancy "farmer's market" creative concoctions and more your classic cocktails crafted with a surgeon's attention to detail. There's something to be said about a guy whose interests are putting out a consistently killer product every night and bypassing hype and trendiness. Truly a tough job, selecting a winner among that talent pool. 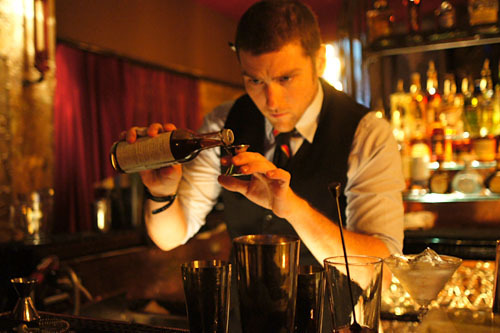 My vote goes for Matt Biancaniello -- I wrote a feature on him for LAW and was truly impressed by the extent to which he goes to make each cocktail a custom, organic, farmer's market-esque creation. His housemade reductions, pickling, bitters, foams and selection of seasonal fruits and vegetables were unending. 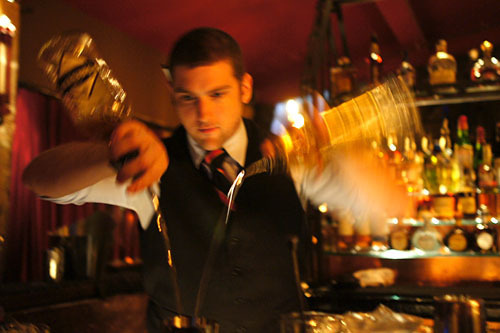 His passion for the craft is evident, not to mention his cocktails were fantastic. I'm voting Joseph Brooke. 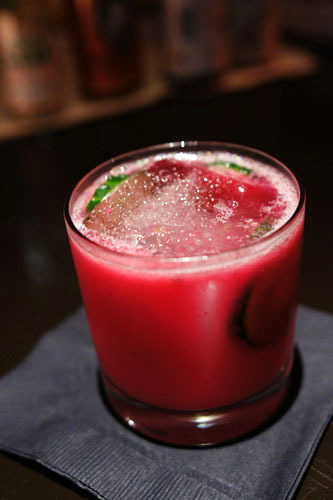 The Invierno cocktail is definitely gonna be my drink this winter. I'm going to go with Devon Espinosa of The Tasting Kitchen. His cocktail list is always creative. Also, he always seems to find unique ingredients with which to experiment. going with joseph brooke from the edison because he is a miracle worker who knows exactly what you need to brighten up your day. Jennifer, I'm currently using a Sony a500 DSLR, paired with a Sigma 28mm f1.8 macro lens.